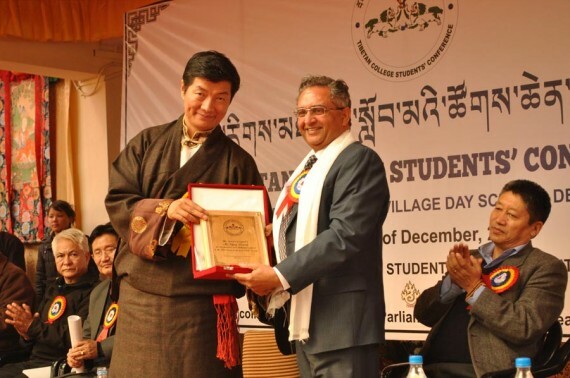 Text of Acceptance Speech on being honoured with the “Tibetan College Students’ Award”. This award was presented to today (26th Dec. 2012) by the Tibetan Prime Minister Dr. Lobsang Sangay during the inaugural function of 7th ‘Tibetan College Students Conference’ which is being held at the Tibetan School, Majnu-ka-Tila (Samyeling), New Delhi between 26-30 December. My dear Young Tibetans from the Tibetan College Students’ Conference, the Regional Tibetan Youth Congress of Delhi, the Students Council and Tibetan Youth Hostel of Delhi. I feel humbled by your kind decision to acknowledge my microscopic contribution towards the cause of Tibet. It is a happy coincidence that these days I am completing 40 years of my association with Tibet. I hope I can claim that I am an outsider who can not only look at your society and your struggle with necessary detachment from a compassionate distance, but also as one who is integral part of your pains, dreams and struggle. I am not exaggerating if I say that Tibetan people are among the most blessed and privileged communities on this earth today. You are blessed with a leader who has the ability to learn from the past and the wisdom to peep into a distant future to give shape and direction to the present. In today’s world there are many leaders across the world who swear by democracy in public but grab the first opportunity to take away the powers of their people on one or other pretext. But Very rarely the human history has witnessed a miracle like today’s Tibet. When His Holiness recently decided to take the Tibetan democracy to a new height by handing over his political powers to elected representatives of the people, we could see how this great statesman was playing His masterstroke to ensure an endless life span for the Tibetan system, Tibetan struggle and the Tibetan nation. Only a Dalai Lama can play this magic. And that too, a Dalai Lama like His Holiness Tenzin Gyatso. I have my own cynical way of looking at Tibetan history and the personality and the role of His Holiness. In those fateful historic days when Tibet slipped suddenly into a serious crisis, Dalai Lama was just a little 16 year old boy. All the big and powerful people around Him, who have been enjoying all the fruits and benefits of their privileged positions in the government and religious hierarchy all their lives, picked up the easy choice of putting this little boy at the front to face the crisis head on. Since then we have watched a little boy of 16 converting a most hopeless situation into one of the most hopeful success stories of human freedom. We are watching the same Dalai Lama growing into one of the most outstanding and most respected statesmen and teachers of recent human history. Unity or diversity of views? In the new democratic system, diversity of views is going to be Tibetan people’s most precious asset and unity is going to be your greatest strength. But it’s also true that both of these virtues — diversity of views and the unity — are non-negotiable and none of the two can be a replacement for the other. Politics with society as its ultimate purpose is an asset. Politics at the cost of social unity is irresponsible. Similarly, forced unity which is aimed at serving the politics, is self defeating, rather suicidal. Having said this, I come to an issue which, I am afraid, has already started threatening the unity of Tibetan society and the morale of its friends. It relates to the prevailing confusion and division among Tibetan refugee community over the issue of Rangzen -vs- Middle-Path. I don’t see any reason why such an issue should cause a divide in your society? In India’s century long freedom struggle against the British Raj, we had two schools of thought which played an equal role in forcing the British colonial masters to quit. One was the ‘Naram-Dal’ or Soft-party lead by Mahatma Gandhi. The other was the ‘Garam-Dal’ who believed in armed struggle. Finally it helped the colonial masters to make a choice. The British showed the wisdom to hand over power to the soft-party and walked away respectfully. I don’t see any big problem or contradiction in Tibetans working simultaneously on the two approaches of Rangzen through non-violence and genuine autonomy — provided the two Tibetan sides don’t forget who their real enemy is? Most of my Tibetan friends are already aware that I am a political animal and seriously illiterate in religion and philosophy. But thanks to my privilege of being around His Holiness the Dalai Lama and many other learned Tibetan scholars over past four decades, I too have come to realize the universality and relevance of Middle-Path. When Lord Buddha or earlier Indian teachers prescribed the concept of Middle-Path, they knew that it was an eternal law which is equally true philosophically, socially, politically or even geometrically. Whether in geometry or in any life situation, whenever there are two points of view or options, there is bound to be a middle point. Hence there is always a middle-path. In dealing with the Chinese leadership, His Holiness too had so many options to pick up from. We must accept that as the leader of Tibet, it was surely His privilege and right to test any of the available choices. He chose to try the middle-path by asking the Chinese leadership for less than ‘total independence’ which He has termed as ‘genuine autonomy’. It was a great concession to a colonialist communist gang who very well knows that Tibet was a free country for a longer time than the Chinese who lived under the slavery of Manchurians, Mongols and others for a long time. But Chinese leaders out rightly rejected Dalai Lama’s offer after deliberately dragging the dialogue for so many years. It was only then that the Tibetans and the world realized that the Chinese leaders were playing this game only to buy time. They misused this time for achieving some ulterior goals, especially to improve their grip on Tibet. Now we find that the two extremes in Tibet-China situation have changed once again. With China walking away from the dialogue table, the final decision is now left between the Tibetans themselves. You have only two options. One is the Chinese slavery for Tibet on the prevailing Chinese terms. The other is ‘Rangzen’ through any means. Going by the philosophy of ‘Middle-Path’ once again, the only Buddhist Middle-Path turns out to be ‘Rangzen through non-violence’. I hope you will not feel hurt if I share my impression that Tibetans living under occupation are less confused and more committed than most of you living in exile. When over a million Tibetans were losing their lives while fighting or suffering the colonial occupation by China, they expressed clearly that that they refuse to accept foreign colonial rule over Tibet. Today again the self immolating Tibetan youths from every corner of Tibet have unambiguously told their Chinese colonial masters and the rest of world that they refuse to accept the Chinese colonial rule over Tibet. In sharp contrast to this, when Tibet supporters like me see some of your opinion leaders and a few from the exile administration involved in bouts of unhappy debate, we feel sad and demoralized. Let us not forget that fractured societies cannot win wars. Neither can they shape their future on their own. Unfortunately, it is their enemy who takes over the charge and prevails. This bickering looks ridiculous when we see that you are fighting for a very just cause. There are thousands of struggling communities across the world who feel envious of you Tibetans when they see that you have world’s most outstanding, most celebrated and a great visionary leader to lead you. You are fighting against a state and a system which are moth eaten with corruption, social inequality, injustice, state terror, religious suppression and political hegemony. All these factors somewhere assure me that Tibet has more hopes today that it had fifty years ago. As I thank Tibetan College Students’ Conference, the Regional Tibetan Youth Congress of Delhi, the Students Council, the members of Tibetan Youth Hostel of Delhi and other Tibetan youths for your magnanimity to my humble contribution towards the cause of Tibet, I assure you that there are many millions of Indians who feel as strongly for Tibet and Tibetan people as I do. I would like to thank all Tibetans as well as your wonderful leader His Holiness the Dalai Lama for introducing a wonderful subject and a great cause to give me purposeful cause to live for.